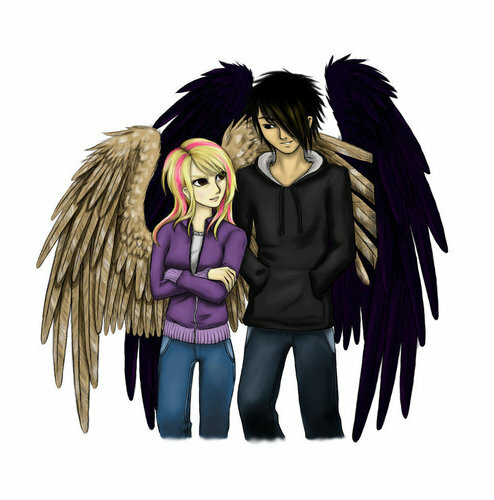 Max & Fang. . HD Wallpaper and background images in the Maximum Ride club tagged: maximum ride fang max. I love the picture, but what's with the pink streaks? I LOVE THE PIC AND FANG!!!!!!!!!!!!!!!!!!!! sitin right beside me . It's awsome. That's the one thing a person can say about it. max's hair color is really confusing~! i like it but what's up with max's hair! I love this picture! My friend drew it for me for my birthday! O.o i have a friend like that he rocks at drawing and me and him had a contest of drawing fang and we drew the same pic but my friends wuz WAY HOTTER it wuz the last day of school and he wuz gonna take it home to color it and give it to me in school next year but i still have my bad drawing I CALL IT MY ANGEL OF DEATH <3 it looks good but i cant draw faces to well...yet every one in my class tells me (including my teacher) that im the best draw in school... yeah right! definitely best picture i've seen of fax. FAX WILL PREVAIL! I looove this picture so much! It is just beautiful! i LOVE fang!!!! he is absolutley adorable but i dont like dylan- fang is much better for max!!! i love him myself!!! you guys gotta check out the videos on youtube on how to annoy different members of the flock!!! hilarious!!!! stop saying amx doesn't have pink hair CUZ SHE DOES! u ppl saeriousley need 2 read the comments AND THE BOOKS! Max looks like Taylor Swift... XD But Fang is awesome. This is just my opinion great drawing but I'm totally in LOVE with Dylan!!! I love this photo. It's my profile photo for fanfiction and Goodreads! And Max got the pink streaks when she was in NYC and got a free makeover like the rest of the Flock.